Late October once again saw thousands of fans of female fronted metal descend on the Belgian town of Aalst for the Metal Female Voices Fest, which is held at the Oktoberhallen in Wieze, on the outskirts of Aalst. This year was the tenth MFVF, and as with the past few years was to consist of a Friday evening followed by long days on Saturday and Sunday. Normally the friday night see's three bands performing, but this year we were in for something special - the Eve's Apple group of singers putting on a one-off show. The evening started later than normal which gave fans chance to shop for merchandise, enjoy a few beers and meet friends from around the world. With so many fans travelling from around the world to MFVF every year then it really is a friendly experience as you get to make so many good friends. Things eventually kicked off with singers coming on stage, performing a song or two before being replaced by other singers. I'm bound to miss a lot from the list, but performers included Maxi Nil (Visions of Atlantis), Elina Laivera (Seduce the heaven), VK Lynne (Vita Nova), Marcela Bovio (Stream of Passion), Clemintine Delauney (Serenity & Whyzdom), Lisa Middelhauve (Xandria), Angel Wolf-Black (Bare infinity) and more. With VK Lynne performing on acoustic guitar most of the songs were arranged very simply, but with so much vocal talent on stage this really was a special night. 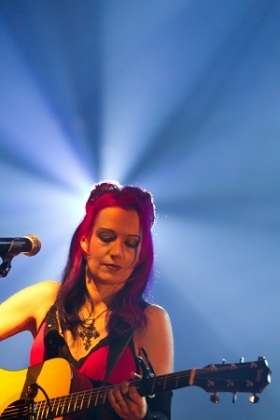 Lisa Middelhauve had been due to perform a new song but following the death of a close friend shortly before the festival she instead paid tribute to him with a stunningly beautiful performance of Xandria's "Eversleeping". The Eve's apple performance wasn't as long as many hoped but was something special that those fans who saw it are unlikely to forget. Saturday started nice and early with Anwynn taking to the stage at 10.30am. Despite the early start they had a good sized crowd. Anwynn had played MFVF in 2010 as a last minute replacement for a band had dropped out, but this time they were advertised as part of the lineup. Anwynn have dual vocals - one sword-wielding kilt-wearing male singer and one female singer. Opening a festival is always hard as fans often take a while to wake up and get into the swing of things, but Anwynn do a great job and it's not long before they have the crowd thoroughly enjoying themselves. A great start to the day. Next came Benighted soul, a band I hadn't seen or listened to before. FOr me that's one of the best parts of MFVF - the chance to see a load of new bands, and as many of the bands who play MFVF rarely (if ever) visit the UK then MFVF gives British fans who travel to MFVF the chance to see a load of new bands in one place. Benighted soul add a Prog element to the symphonic metal and sound great. I've never been disappointed by the quality of bands at MFVF and this year was no exception. Benighted Soul were extremely good - certainly good enough for me to buy their CD at the merch stand just in time before they sold out. Italian band Crysalys came next. Singer Chiara Malvestiti has a very operatic style of vocals and her vocals soar above some really heavy guitar, bass and drums. Her vocals really are powerful as well as sounding beautiful, and it's only a matter of time before the band are back at MFVF with a spot much higher up the bill. Greek band Seduce the heaven came next. This was another band I'd been looking forward to seeing. A melodic death metal band they use the fairly standard formula of clean female vocals and growling male vocals. Elina Laivera has a beautiful voice and it works perfectly with the heavy music and the male growls. Lahannya was next, another MFVF veteran, and one with a different sound to any other band on the bill. Lahannya doesnt do symphonic metal, gothic metal or melodic death metal - the genres that make up most of the lineup, but instead has an alternative industrial sound which adds some extra variety to the bill. Lahannya is as always on top form and she really knows how to work a crowd. To add extra impact to their performance, Lahannya had some jets of flames shooting up during the show, which not only looked spectacular but also raised the temperature noticeably. Dimlight came next, one of several Greek bands on this years bill (along with Seduce the heaven and Meden Agan). They were excellent - full power metal, beautiful vocals, and a good performance. Dimlight mix beutiful female vocals with growling male vocals to full effect. During their set the band were joined on stage by Angel Wolf–Black and Grace Meridan for ’Absence Of Light’. Amberian dawn were next up, with what later turned out to be their last performance with singer Heidi Parvanen (news that wasn't announced till a week or two after the festival). I have to be honest and say I hadn't been impressed with Amberian Dawn's previous MFVF performance in 2009, so I wasn't expecting a great deal from them tonight. Happily they were far better than I had expected - the previous occasion may have been poor but this time they were firing on all cylinders and put in a great show which I really enjoyed. Arkona were a band I'd been looking forward to seeing. Their trip to the UK earlier in the year had fallen through due to visa problems, so this was my first chance seeing them. Heavy folk metal seemed a bit out of place when you looked at the lineup, so I did have real doubts as to how well they were going to go down, but I needn't have worried - they blew the place apart. The sheer amount of energy coming from the band was staggering and the crowd loved them - large parts of the crowd were bouncing around while others had horns in the air while others simply enjoyed it. Almost nobody will have understood the lyrics as the band sing in Russian, but that really didnt matter tonight - what mattered is that Arkona put in a superb performance. I hope to see them again before too long as that performance was superb. Delain were next up. A far less energetic band, Delain's symphonic metal has a more relaxed pace which allows the crowd to recover from the energy of Arkona. Delain get better and better every time I see them and tonight is no different - the music is superb and Charlotte's vocals are equally impressive. Tonight George Oosthoek joins Delain for an amazing cover of Within Temptation’s ’Deep Within’. It's a very different performance to either Arkona or Arch Enemy, but that's part of what makes MFVF such a great festival - there is a lot of variety in the bands so there is something for everyone. Arch Enemy are the second to last band tonight, a change from their last appearance here where they headlined. Arch Enemy are a band that really know how to put on a great show, and every time I've seen them they've been superb, and tonight is no exception. Despite being heavier than most band swho play MFVF they still go down superbly well with the crowd, and a couple of friends of mine who don't normally like the heavier music were still impressed by Arch Enemy. Their amazing performance felt like a headline set, and it felt strange after their set to realise we still had another band to go. 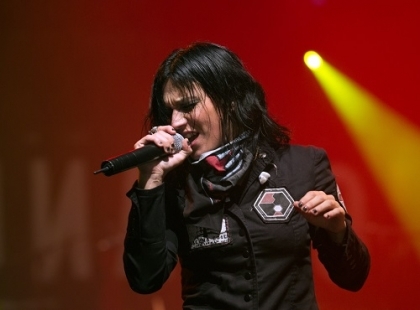 The headliners on Saturday were Lacuna Coil, who last played at MFVF way back in 2005. Coming after Arkona, Delain and Arch Enemy would be a real challenge for any band, but Lacuna Coil seem completely confident, and rightly so. Lacuna Coil have a lot of festival experience and they bring it all to bear tonight as they do the impossible - and outperform Arch Enemy. They use every bit of the stage, helped by having two vocalists, so they can each take one side of the stage at the front while the rest of the band use the rest of the stage. They never stand still and move around the stage making sure they interact with as much of the crowd as possible. A stunning performance which shows that they really deserved the headline slot. So the first full day was over and I was exhausted after watching 12 great bands as well as spending time talking to friends and bands between sets - plus the occasional beer or bite of food to keep me going. It was a long day but a superb one, so it was time for some sleep before the final day. Sunday started with three bands that were new to me - Valkyre, November-7, and Meden Agan. All three were great, but it was Meden Agan from Greece that really stole the show. Their young singer Iliana was outstanding despite clearly being overwhelmed by the great reception the band were getting from the fans. To make their set even more special they were joined by Maxi Nil and Karolina Pacan for a fantastic performance of Within Temptation’s "Somewhere". 69 chambers came next. The Swiss three-piece put in a flawless performance and really were impressive, but straight after them came Trillium, fronted by the owner of one of the best voices around - Amanda Somerville. What can I say other than WOW. Amanda Somerville's voice is simply stunning in quality and power and backed up by some great heavy music really blew the crowd away. Sarah Jezebel Deva came next and in my opinion suffered from having to follow Trillium. Her performance was far better than at her previous visit to MFVF, and she and her band put in a great set, but looking at the crowd it was clear that she wasn't a particularly popular choice for the festival. Trail of tears came next and as always put in a good performance, but after a few songs I had to give in to hunger and go and find some food as I didnt want to risk missing any of Diabulus in musica who were on next. They are another band who are always worth watching, and tonight was no exception. What made their set even more special was a duet with Melissa Ferlaak. Xandria were next up as the weekend drew closer to its conclusion. They had played the friday night at last years MFVF but this year were one of the main bands, and they really showed why they deserved such a high billing. They were just unbelieveable, and singer Manuela Kraller just made things look easy. Definitely one of the best performances of the festival if not The best. In the VIP area after their set, I witnessed something I'd never seen before - as Manuella walked out of the backstage area into the VIP area she was greeted with a standing ovation from practically everyone there. She looked shocked by the spontaneous applause but she and the rest of the band definitely deserved it for such an outstanding performance. Epica were next up to close the festival. Epica have played MFVF most years so are always guaranteed a warm reception. CO2 cannons and flame jets coupled with a superb lightshow looked spectacular, but in some ways were unnecessary - Epica were so good tonight that the visuals weren't needed to make an impression, but what the hell - this was a spectacular way to end the festival. Their 90 minute set covered songs from the length of the band's career. My only question after this performance was "How on earth can they beat this next time they play".